The number of seats in LiveChat determines the number of agents that can be logged in at the same time (regardless of their status.) For example, if you subscribed to LiveChat for three seats, three of your agents will be able to log in. The number of seats can be different from the number of agent accounts you have. For example, you can have 10 agent accounts created while having only three seats. In such situation, only three of your agents will be able to log in. When you reach the agent limit and one of your offline agents decides to log in, he or she won’t be able to connect to LiveChat. These attempts won’t sign the currently logged in agents out of your LiveChat. This is the case for all agent account types: Normal agents, Administrators and the Owner. If one of your agents forgets to log out and takes up a seat, you can log out that agent remotely. This can be done either through the Agents section or by using LiveChat’s API. To log out an agent in the Agents section, select the agent you would like to sign out and click on the Log out link. Check out our API documentation to learn more about logging agents out using REST API. Owners can increase the number of seats in the Subscription section. To learn more about getting more seats, check out our tutorial on modifying the subscription. If you don’t want to add seats manually whenever you go over the limit and more agents need to log in, you can enable a nifty little option called Flexible pricing. 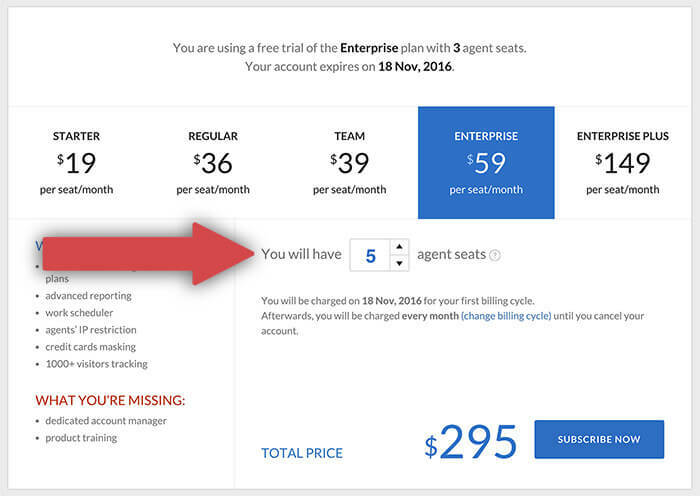 Flexible pricing allows you to automatically add agent seats whenever an agent tries to log in and you are already at your seat limit. This will add another seat and bill you accordingly. You can enable Flexible pricing in the Subscription section. Simply tick the Enable flexible pricing box and confirm the subscription. Flexible pricing can be a lot of help when you don’t really know how many chats you can expect and you don’t want to miss out on any opportunities.